Like a joyful garden brought indoors, our "Garden Splendor" bouquet bursts with sumptuous orange, yellow, and purple blooms. Dramatic yet never fussy, this lovely gift says everything from "Congratulations" to "Happy Birthday" and doesn’t scrimp in the scent department! 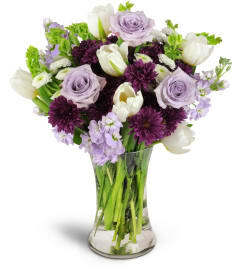 Just what fresh flowers should be, these roses, lilies, and campanula stems convey your caring message with style. 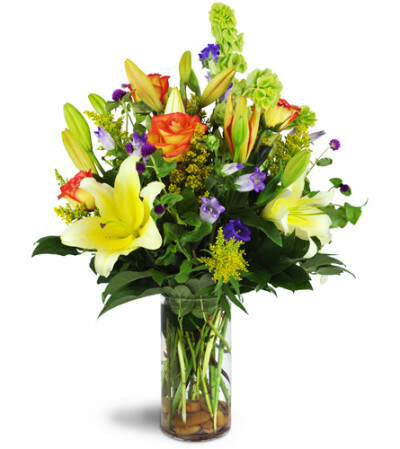 Lilies, roses, and so much more are arranged in a tall cylindrical vase, accented with river rocks. Called today (from Ohio) because my girlfriend and family were flying in for vacation. 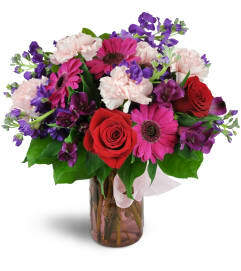 They delivered an amazingly beautiful arrangement of flowers that waited for them in their hotel room when they arrived. Dee was very thorough on the phone and a pleasure to deal with. Thanks! Artistic Way florist is amazing, they go above and beyond to create the most beautiful floral arrangements and awesome customer service! Artistic Way Tropical Garden is a Lovingly Florist in Fort Lauderdale. Buying local matters. Discover how Lovingly supports local florists. Copyrighted images herein are used with permission by Artistic Way Tropical Garden.